More than 1,000 Marines from Marine Corps Base Camp Pendleton were deployed to the U.S.-Mexico border Thursday to support U.S. Customs and Border Protection and the Department of Homeland Security in anticipation of a caravan of Central American migrants headed for the border. The deployment of 1,100 Camp Pendleton Marines is part of the federal government’s effort to stop the caravan, estimated to be more than 600 miles from the nearest border crossing. The Pentagon originally dubbed the operation Faithful Patriot, but dropped the title after Tuesday’s mid-term election. Camp Pendleton Marines are expected to help build barricades and temporary barriers to keep the caravan at bay. President Donald Trump has pledged to send up to 15,000 troops to the border. U.S. Department of Defense estimates reported by NBC 7 San Diego have the deployment at roughly 7,000 troops spread across California, Arizona and Texas. 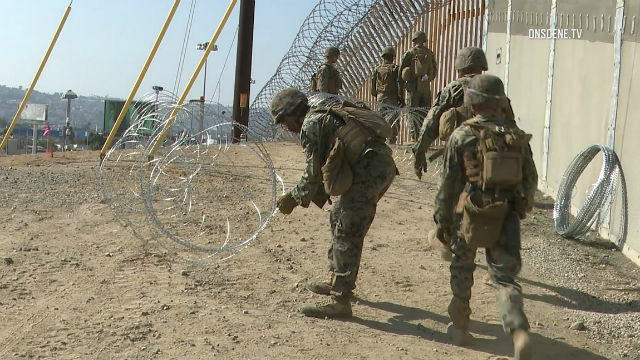 Camp Pendleton and Marine and Marine Corps Air Station are expected to house troops assisting Customs and Border Protection during the operation. According to the Orange County Register, Naval Air Facility El Centro, Naval Base Coronado, Naval Base San Diego and Naval Base Point Loma have also been put on notice.